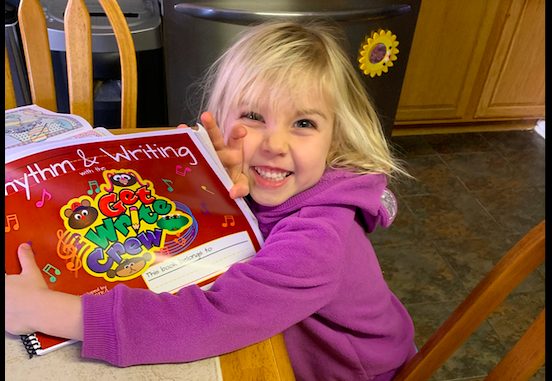 Rhythm & Writing can be a fun way to teach and practice handwriting with their Rhythm & Writing with the Get Write Crew. 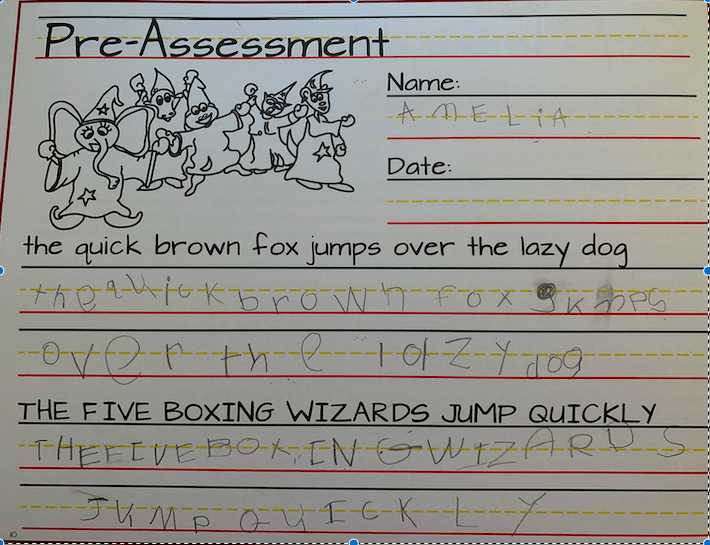 Recently, we had the opportunity to review their handwriting curriculum with our 5 year old and she really enjoyed it! We received the Rhythm & Writing with the Get Write Crew curriculum which included a book and an accompanying transcparency sheet to use with the book. Additionally, we received access to online videos with songs that accompany learning the letters. The spiral-bound workbook is really good quality with thicker paper and easy to use. The pages have lines that are big enough for ease of use. Since we are working with teaching the student to write manuscript letters, it is important to have easy to utilize and see lines. 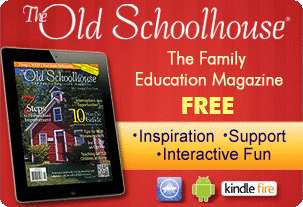 The pages are full color making it easy to navigate for you and the student. The lines are different colors to make explaining which line to go to easier as well. The top line is blue, the bottom line is red and the dotted middle line in yellow. I liked the yellow color of the middle line because it was easy to see where the middle was without confusing it with the solid top and bottom lines. The curriuclum is going to teach your child manuscript handwriting. It can be used for students learning to write or for students that need work on their penmanship. There is even a pre-assessment you can order from the company that will help you identify what your student needs to work on. Or there is a self-assessment at the beginning of the book that you can take to make the determinations yourself. You get the picture. And in the music videos, they sing this. The songs are kind of a rhythmic beat (kinda like a rap) but easy to understand and pretty catchy. The songs are sung and played by “The Crew.” These characters, Big Country (guitar), Hip Hop (lyricist), Mo Rock (drums), and Jazzy Faith (keyboards and vocals), are seen throughout the curriculum teaching the letters and appear in all the music videos. Lastly, the curriculum included one sheet of transparency to use with the workbook. It was suggested that, as the student is working on their letters, to practice on the page with the transparency and use dry erase markers until mastery it there and then move to the workbook. We do this a lot in our homeschool so the kids were used to doing this. It worked really well and is a great way to get in a lot of practice where needed. 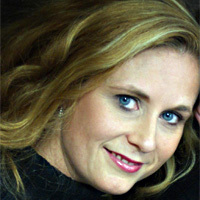 Rhythm & Writing with the Get Write Crew with the Rhythm & Writing is the creation of a school-based occupational therapist, Nikki Wilson. Nikki wanted to help parents, teachers, and others in need of assistance with student handwriting development by using a unique approach to teaching the skills needed to be successful in learning to write properly. We really enjoyed the program. My daughter liked the writing practice and enjoyed the music videos. She found the songs catchy and fun to move to. She is 5 and learning to write her letters so this was a good program to work on her letters and formation of the letters. The catchy phrases on how the letters are formed was fun for her and made explaining the letters to her easy. We tried listening to the videos and then doing the corresponding pages and then we tried doing the pages and then watching the videos. I really am not sure either is better than the other. However, for me, personally, I liked watching the videos first because then I knew the song (or beat) to “sing’ when we were practicing the letters in the workbook. 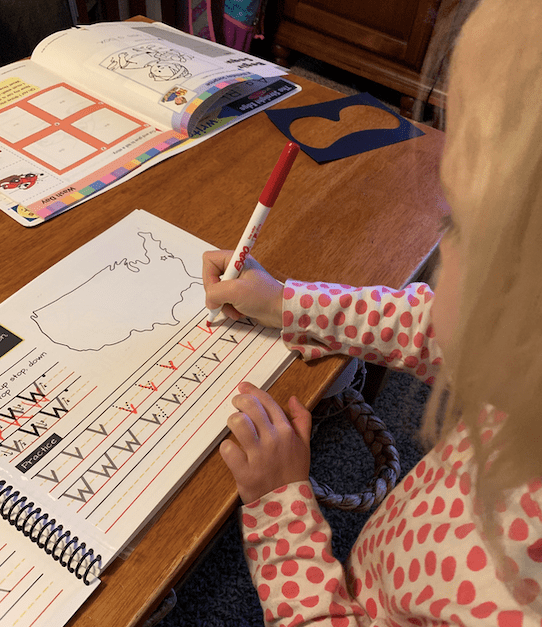 She didn’t really care much about coloring the pictures in the book but there were corresponding pictures for each lesson. Additionally, there are pages explaining the theme of the next few pages. This I read to her because she isn’t reading yet, and then the pages go on to correspond to the theme. For instance, one of the themes in the books is “I Can Do All Things” and it introduces lowercase “a” (athlete) and lowercase “d” (doctor). I really liked the theme stories and the positive reinforcement and affirmations that were in the songs and stories. I was actually pretty impressed by this in fact. For instance, the theme I mentioned “I Can Do All Things” is very positive in just the title but talked about the friends playing basketball and singing about the letters and then one of the friends has to leave to go to the therapy. He works hard every session because he believe he can become a world famous wheelchair basketball player, and drummer. His best friends believe it too. I have to admit – when we played the first music video I was very surprised to hear something resembling rap music and got a little uncomfortable. But, after listening, it really grew on me and I don’t mind it. My daughter really liked them so I think I got over my first impression. At the end of the workbook there are practice pages for all the letters. Then there is a post-assessment with the same material as the workbook pre-assessment so you can compare the writing and see the progress. The back of the workbook includes some additional information on how the curriculum links to common core standards. Overall, we were pretty impressed with this curriculum. It’s simple and easy to use but gives you some pretty good bang for your buck in what you get out of the course. I think handwriting is important to develop at an early age and therefore I find a quality handwriting program important. I like that you can adapt it to your needs. You can use it as a full, beginning manuscript handwriting program or you can use it to work on letters that need some attention. Check out what the rest of the Homeschool Review Crew had to say about Rhythm & Writing by clicking the banner below.